This is a very quick and simple greeting card that is suitable for all kinds of occasions. Cut a 3 1/2" x 8 1/2" strip of pink card stock and border punch it. Adhere it diagonally across the card and trim it to fit. 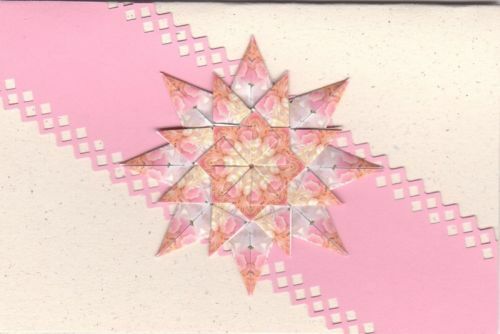 Add the medallion (follow the link below for the triple-star tea bag fold instructions), add a sentiment and it's ready to go. Pink card blank 4" x 6"